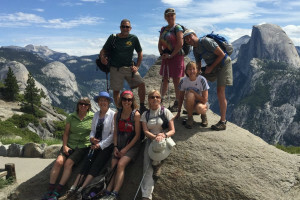 Hiking in Yosemite is an adventure with countless trails to enjoy, ranging from short and easy to longer more strenuous treks, all giving you the ultimate Yosemite backcountry experience. Try a 3- or 4-day trek, fully-outfitted & guided, to experience the Park's scenic vistas, waterfalls, meadows and wildlife. We're Yosemite experts. Who doesn't want to share this pic with family? You'll love our fully-supported hikes throughout the Park. Committed to adventure for over 37 years – we know adventure! Our trips have something for everyone - lakes, streams, wildflower meadows, wildlife, waterfalls, tall forests and more. Click to see our options, rates and available dates. Chile Pepper Bike Shop has all the bike equipment you need for a mountain bike excursion in Moab, Utah. Hiking Yosemite provides some unique hiking opportunities, no matter if you are hiking for the first time or seeking some challenge to your expert skills. 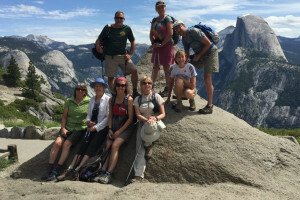 Many trails are perfect for families, taking you to waterfalls along easy paved trails, and others are suited to expert hikers who want to have an overnight adventure in the Yosemite backcountry or climb some of the towering rock formations. No matter your preference, you will find spectacular views, amazing natural attractions and gorgeous weather. 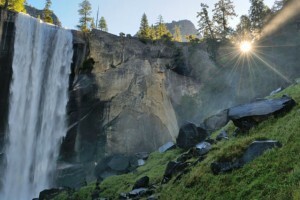 This easy paved trail takes you to the base of Bridalveil Fall, a 620-foot cascade creating a mist as the breezes blow. In spring, you may get slightly wet as far away as a quarter of a mile. For a Yosemite CA hiking experience, this is perfect for the whole family. Trailhead: From Yosemite Valley, head toward Wawona and the south of the park on Wawona Road. The trailhead is at the Bridalveil Falls parking lot not long after turning onto Wawona Road. Take this scenic walk to this incredible 2,425-foot waterfall, perhaps the most popular waterfall in Yosemite, and certainly the tallest in North America. Plenty of dramatic views make this an easy hike well worth the time. Trailhead: The Lower Yosemite Fall Trailhead is at shuttle stop 6, and the shuttles are free. You can also walk there from Yosemite Village; it’s only about a half-mile west and a short stroll when parking along Northside Drive. 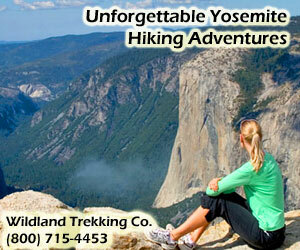 Yosemite California hiking is at its best when climbing Lembert Dome. The views at the top are spectacular as you look off across Tuolumne Meadows. You are climbing a mountain so you should remember to be cautious as you go. Trailhead: From Yosemite Valley, you can reach the trailhead by taking Highway 120 to the turnoff for Tioga Road. Go 40 miles east to the parking for the trailheads for Lembert Dome and Dog Lake Trail. Hiking the trail for 3 miles of moderate hiking will take you to Vernal Fall. You can continue on to Nevada Fall, but keep in mind, this will be a 7-mile round trip trek and you’ll need to allow more time. You’ll discover fabulous views all along the trail. Be sure to stop at the beautiful bridge overlook. Trailhead: From Yosemite Valley, follow signs to Curry Village. About a half mile past Curry Village, you will find parking and it will be another half mile or so to the trailhead. You can also park at any lot in the eastern portion of the valley and take a free shuttle bus to the trailhead. This strenuous climb is a chance to get unique views of Yosemite Falls and Half Dome. The falls is a roaring cascade in spring and early summer. Remember to bring plenty of food and water to last you for the entire trek, as it’s quite a workout. Trailhead: You can park just south of Yosemite Village to get to Lower Yosemite Falls Trailhead, or take a free shuttle bus to the trailhead from anywhere in the eastern section of Yosemite Valley. 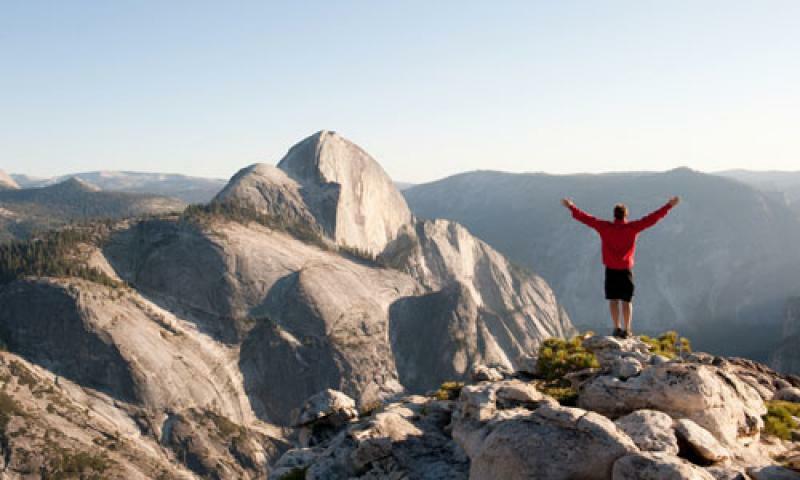 A popular though strenuous hike, the Four Mile Trail will take you from Yosemite Valley to Glacier Point. Breathtaking views are around every corner, from Cathedral Rocks and El Capitan to Tenaya Canyon and Half Dome. From December to May, the trail is closed for Yosemite hiking due to hazardous conditions. Trailhead: The trailhead begins in Yosemite Valley near the base of Sentinel Rock. You can park near Yosemite Lodge, or catch a shuttle to the Lodge from elsewhere in the valley. You can also access the trailhead from the opposite direction at Glacier Point, at the end of Glacier Point Road off of Wawona Road and south of the valley. This is a great overnight backpacking experience into the backcountry. Staying at the highest of High Sierra Camps is quite an experience in itself! You’ll follow the Lyell Fork of the Tuolumne River, starting an ascent to Tuolumne Pass at the Rafferty Creek junction. Trailhead: The trailhead is in Tuolumne Meadows across the road from the Dog Lake parking area. From Yosemite Valley, take Highway 120 to the Tioga Road turnoff and follow it to Tuolumne Meadows. 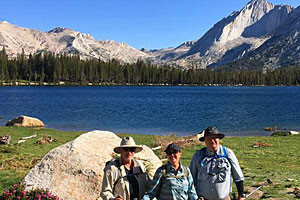 High Sierra Packers links willing backpackers with local organizations and outfitters that can guide trips into the High Sierra wilderness. The Sierra Foothill Conservancy is dedicated to preserving the lands of McKenzie Table Mountain Preserve and the Mary Elizabeth Miller Preserve.